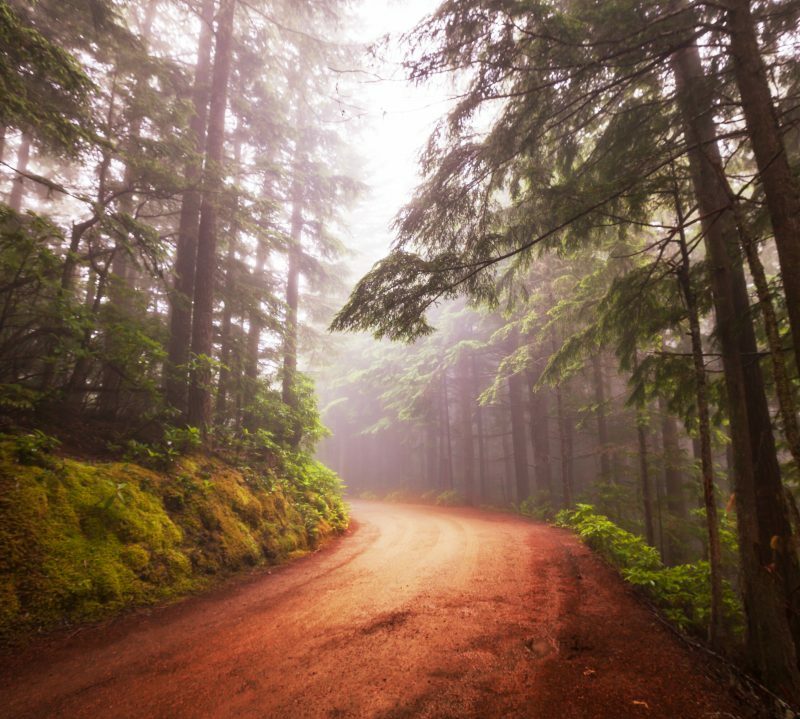 There’s something deep in our biology that finds solace in the sounds of nature. Water rushing. Crickets chirping. A whispering wind. Imagine our ancestors resting in natural shelters and earthen homes, intimately attuned to the world, the sounds and sensations that colored their inner landscape. Howling coyotes. A crackling fire. A chorus of frogs. Little children who spent their lives beside babbling brooks or beneath tropical canopies must have been lulled by these natural songs as if they were the voice of their own mother. Spring approaches in the Willamette Valley. Tucked away from the city lights and busy highways of Portland, the farm has been resting. Soil has frozen and thawed, compost piles have slowed their alchemy, spiny trees have gone to sleep. Inside the house the buzz of energy has continued through winter. Outside, the first hints of warmer days are emerging. Buds are forming on branches. It’s golden hour. Sunlight streams through the windows as dinner is served, in contrast to the deep black evenings of weeks past. Amidst the clinking of dishes and the hum of friendly banter another rhythm can be heard. There is a song coming from outside, floating out from the pond on the far corner of the property. The Pacific treefrogs are back. They’re accompanied by the Northern red-legged frogs (a protected species in Oregon) who’ve been competing with a band of American bullfrogs for years. Warming temps have stirred them from their cozy hideouts, an invitation to liven up. They stretch their springy legs. They fill their tiny lungs. A faint chirp, a raspy croak emerges. It is akin to the first “good morning” we mutter after sleeping in on a Saturday. Ahem. The tiny green conductor clears his throat and tries again. Do. Re. Mi. Fa. So. La. Ti. Do. A song reverberates across the pond and multiplies. The others join in the chorus. Calls dance atop one another; fluttering, percussive, melodic. It’s a song with no particular structure or arrangement, yet perfect in its wildness. There’s a comical challenge in trying to assign human words to these voices in nature. Was that a ribbit? More of a croak? A cheep, or a chirp? The song swells and drifts across open fields. One thing is certain: this delightful serenade is the call of Spring. Soon she will arrive in full swing, lush with her spirit of newness: growth, effort, anticipation, union and creation. A time for bringing forth and ushering in. 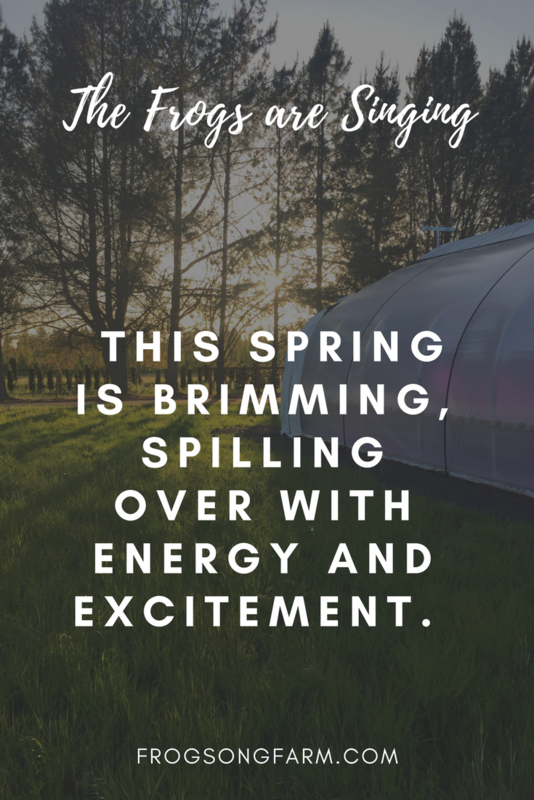 This spring at Frogsong Farm is unique from seasons past. It is a spring brimming, spilling over with energy and excitement. We are preparing to launch our website and share our offerings with the world. The frogs that hatched last year, while we planted our first hemp crop, are now beginning to sing and reproduce. We are coming full circle. The hemp flowers that bloomed beside the pond have been transformed into salves and tinctures, ready to express their healing properties and improve lives near and far. Momentum is building. Friends share with friends, and as the good news rolls in over and over, (“I can’t believe this stuff works!”) we are propelled forward in our mission. The bread baker. The MMA fighter. Our passion is people, and we are moved by the good we’ve begun to witness around us. As our namesake frogs find their voice this spring, we are finding our voice as well. We are stepping into our place within the CBD industry as a company for community. With joy we offer up our pure, high-end CBD products at fair prices. Our purpose becomes clearer still as we partner with local non-profits serving marginalized communities. Improving access is crucial. These values are at the heart of our farm and will always be essential to our understanding of success: hemp farming should benefit people and the planet. This is more than a business endeavor for us. This is a vocation. It is a calling that we feel privileged to answer. Tending to the precious hemp plants and their powerful medicine is both soul-nourishing and bone-tiring. It’s the best kind of work. Long days under the open skies hearken back to our roots. We get to connect with the earth, to feel the soil beneath our fingernails and the sun on our skin, as humans always have. As nature sings the melody, we seek to play harmony. The fields invite us back day after day, season after season. We can’t resist. The tender and tough native frogs remind us that we are a company built on a spirit of earnest effort, following nature’s rhythms, and hopeful anticipation of what’s to come. We hope you will join us in this spirited adventure! This entry was posted in Essays & Creative Writing, People, Places. Bookmark the permalink. Meet Frogsong Farm at the Farmer’s Market! I “met” with you this morning at the Beaverton farmers market. So wonderful to see hemp derived CBD coming of its own and in my farmers market no less! Just wanted to share that I’ve been looking for a source closer to home and am glad I found you.